Elijah was strong in the spirit of God and when he knew his time on earth was near to ending he asked Elisha what he should do for him? Elisha’s request was that he receive a double portion of his spirit, and Elijah said if he was seen by Elisha when his time had come to be taken it would come to pass for him (2 Kings 2:8-14). And Elijah took his mantle, and wrapped it together, and smote the waters, and they were divided hither and thither, so that they two went over on dry ground. And it came to pass, when they were gone over, that Elijah said unto Elisha, Ask what I shall do for thee, before I be taken away from thee. And Elisha said, I pray thee, let a double portion of thy spirit be upon me. And he said, Thou hast asked a hard thing: nevertheless, if thou see me when I am taken from thee, it shall be so unto thee; but if not, it shall not be so. And it came to pass, as they still went on, and talked, that, behold, there appeared a chariot of fire, and horses of fire, and parted them both asunder; and Elijah went up by a whirlwind into heaven. And Elisha saw it, and he cried, My father, my father, the chariot of Israel, and the horsemen thereof. And he saw him no more: and he took hold of his own clothes, and rent them in two pieces. He took up also the mantle of Elijah that fell from him, and went back, and stood by the bank of Jordan; And he took the mantle of Elijah that fell from him, and smote the waters, and said, Where is the Lord God of Elijah? and when he also had smitten the waters, they parted hither and thither: and Elisha went over. 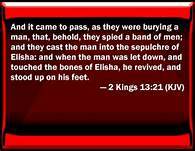 We really see the powerful eternal spirit when Elisha was buried and the band of the Moabites invaded the land, only when they went to bury a man it turned out they had dug up the sepulcher of Elisha and when the man touched Elisha’s bones, he revived, and stood upon his feet! (2 Kings 13:20-21). And Elisha died, and they buried him. And the bands of the Moabites invaded the land at the coming in of the year. And it came to pass, as they were burying a man, that, behold, they spied a band of men; and they cast the man into the sepulchre of Elisha: and when the man was let down, and touched the bones of Elisha, he revived, and stood up on his feet. When Jesus died there was a great earthquake and the graves of the saints opened, and after the resurrection the people rose up and went into the holy city to appear among many. The powerful eternal spirit of God surpasses death! (Matthew 27:50-53). Jesus, when he had cried again with a loud voice, yielded up the ghost. And, behold, the veil of the temple was rent in twain from the top to the bottom; and the earth did quake, and the rocks rent; And the graves were opened; and many bodies of the saints which slept arose, And came out of the graves after his resurrection, and went into the holy city, and appeared unto many.